A HVAC is an appliance that runs 24/7 during the extreme months of winter and summer. A sudden breakdown will throw your life out of balance for some time. You will be running from pillar to post to get it repaired during peak seasons, when technicians are difficult to avail. Therefore it is always better to keep your machine maintained and regulated to avoid these mis- adventures. There is an old English adage - A penny in maintenance can save a dollar in repairs. An annual maintenance contract for your air conditioner would cost much less than reactive repairs. An air conditioner is a central device that is prone to develop small snags now and then. In a neglected device these faults will grow big and require costly repairs or untimely replacement. Regular maintenance will keep the device operative at the peak of its efficiency. This will make a huge difference in utility bills. 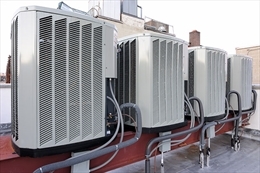 Modern AC units are robust and hardy and are designed to last for many years. But they need yearly maintenance to provide long-term service. Some manufacturers also specify servicing your equipment once a year to prevent the warranties from becoming void. Warranties are really useful to get discounts on repair bills. An annual contract will facilitate you for emergency service. If your machine breaks down all of a sudden then the technician will come and address it the same day no matter how busy they are. Besides this your HVAC will be tuned up once in spring and the other in autumn routinely. You do not have to book an appointment for it.